Discover the rich, masculine scent of Polo Red Intense by Ralph Lauren, a singularly distinctive fragrance introduced in 2015. Perfect for everyday wear to the office or for special occasions, Red Intense delights the senses with hearty base notes of robust leather and coffee, while hints of blood grapefruit, cranberry and ginger offer an exhilaratingly fresh fragrance. With just a touch of lemon and saffron, this scent for men is slightly fruity with a clean finish, ideal for year-round wear. 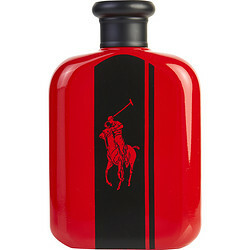 Polo Red Intense- Smells awesome, it's a must have! Great price, shipping was fast, and the gift box it arrived it was perfect. Definitely recommend!!! My son really likes Polo Red by Ralph Lauren. I bought the Intense Red Eau De Parfum spray. His bedroom smells fantastic. Great price!